The Prince Resort offers new luxury suites in the quiet north end of the 60-mile stretch of beach we call the "Grand Strand". Located in the exclusive Cherry Grove section of North Myrtle Beach, this new resort offers first class amenities including an oceanfront restaurant, lounge, outdoor tiki bar and grill that overlook the Atlantic Ocean, natural marshes and Cherry Grove inlet. Located just outside your oceanfront doorstep sits the famous 985-foot Cherry Grove Pier featuring a variety of fishing contests and other outdoor recreational opportunities. The resort has outdoor pools, 230 feet of lazy rivers, spacious sun decks, four Jacuzzis, two kiddie pools, a fitness room, business center, and game room. 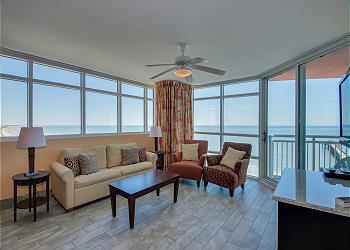 All suites are non-smoking and boast an upscale, open floor plan with complimentary high-speed Internet.